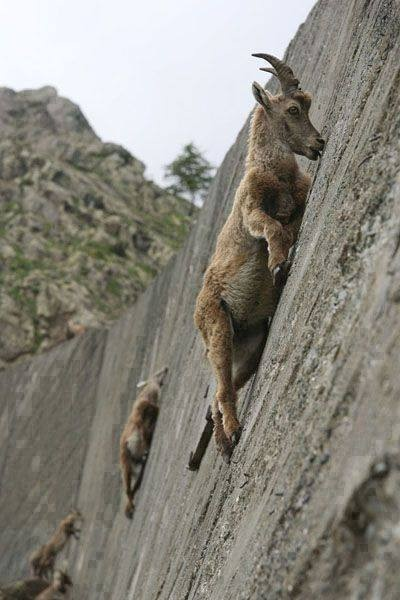 Mountain goats can obviously climb, but did you realize what amazing climbers they actually are? These crazy mountain goat photos prove that the death-defying goats would make even the world’s best rock climbers jealous. They go to especially great lengths to get salt, as seen in the photo above, licking the stones for their salts and minerals. These incredible pictures reveal a herd of sure-footed mountain goats climbing an almost vertical dam in search of salt. These goats look like they were just stuck on with velcro or something! These goats definitely have an advantage when it comes to getting the best views. Here, they check out a gorgeous waterfall in an unknown location. If you look closely, you can see this mountain goat contemplate his next move along the sheer walls of the Grand Canyon of the Stikine River in northern British Columbia. The goats, which live only in the canyon, use paths along the walls to avoid predators living above.